Recently, a member of the public dropped off some tiny caterpillars at Carnegie Museum of Natural History’s Section of Invertebrate Zoology for identification. Our staff identified them as Polyphemus moth caterpillars (Antheraea polyphemus) and have been rearing the caterpillars and taking pictures as they grow in order to document the different stages. These are images of the larval (caterpillar) and pupal (pupa and cocoon) stages of the Polyphemus moth, which is in the family Saturniidae. These Polyphemus caterpillars go through five instars after they hatch from the egg. Instars are the stages between each molting of the caterpillar as it grows. Included in this set of images is a picture of the first instar, which is about 3mm long and a picture of the last instar which is significantly bigger—about 6 or 7cm, depending on how far it is stretched while eating. The third picture is of one of the cocoons made by these caterpillars. Inside of each cocoon is a dark brown pupa which the adult moth will come out of. Some species like the Polyphemus moth spin a cocoon, but there are species that don’t. Their pupae are usually formed underground for protection during the winter. The adult Polyphemus moths should eclose next year, around May or June—so they will spend the winter in the pupal stage. This is a species that occurs here in Pittsburgh, and people could be seeing fully grown caterpillars around this time of the year. This culture was reared on oak leaves, but they like many other kinds of host plants, including: apple, ash, birch, dogwood, elm, hazel, hickory, maple, rose, and willow. 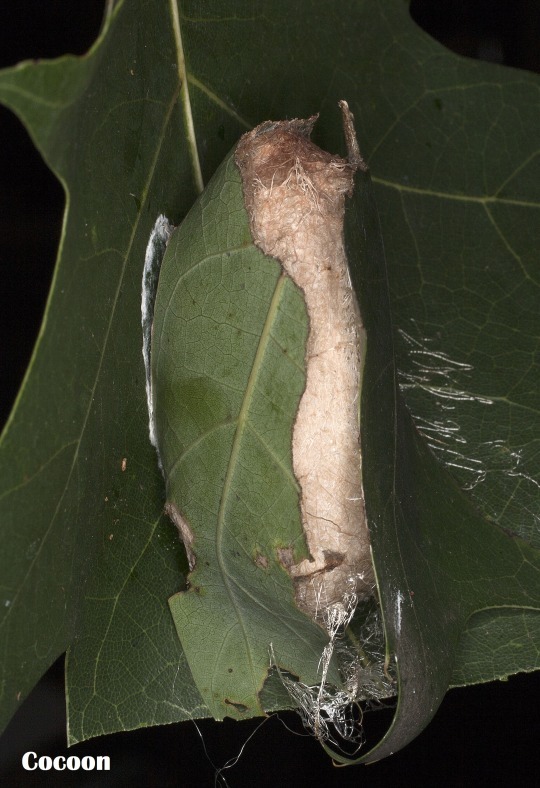 It is visible in the image how the caterpillar spun its cocoon in the oak leaf. In its natural habitat, this cocoon would drop off the tree in the fall and over-winter in the leaf litter on the ground. Vanessa Verdecia is a collection assistant in the museum’s Invertebrate Zoology Section.